Eco Seal® Series – Gaska Tape Inc.
Closed-cell Eco Seal® Series foams (ESL), are specially formulated for sophisticated industrial, automotive, and construction applications. ESL600, light density foam is easily flexed and compressed and exhibits excellent conformability. 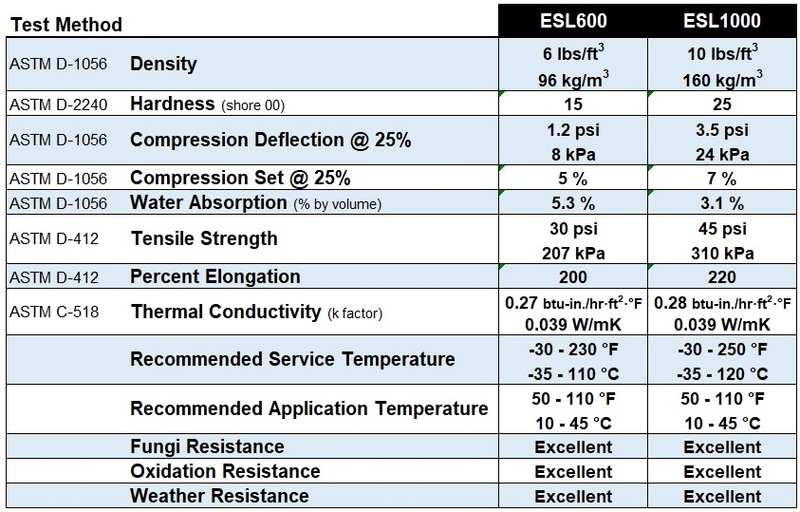 Test results demonstrate that ESL600 can be classified to 2C0 (SCE-40) as specified by ASTM D 1056 and SAE J18. ESL1000 is a medium density foam that exhibits good conformability with excellent dimensional stability. Test results demonstrate that ESL1000 can be classified to 2C1 (SCE-41) as specified by ASTM D 1056 and SAE J18. Revolutionary in composition, Eco Seal® Series foam products compete favorably with high end rubbers such as EPDM, Nitrile, SBR Blends, ECH, EPT and (depending upon the application) heavy density urethane foam. Characteristics common to all Gaska Tape flexible closed-cell foam products include the ability to make a long life seal against air, moisture, light and dust penetration. Eco Seal® Series closed-cell flexible foam completely seals out air, moisture, light and dust when compressed 30% or more. With a service temperature of -30°F to 250°F, it’s an excellent product for protection of materials over these broad temperature ranges. Totally unaffected by harsh chemicals such as gasoline, oil, hydraulic fluid, brake fluid, alcohol, and anti-freeze, as well as sulfuric acid, nitric acid and even hydrochloric acid. Does not become brittle or exhibit loss of properties over time and wide temperature ranges. Plasticizer migration virtually eliminated to eradicate marring, crazing, or cracking problems. Maintains physical properties under various sterilization conditions. All tests were performed on material without PSA. Above values reflect average properties.